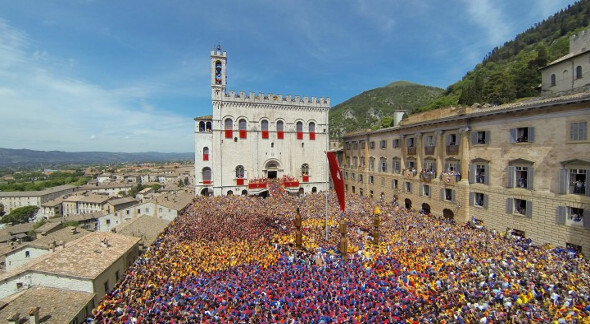 The 15th May of each year is a date marked red on the calendar of the "eugubini", the inhabitants of Gubbio. It is infact the day of the "Festa dei Ceri", one of the most exciting event of Umbria and probably of Italy. All the city of Gubbio will participate to this feast, young and old will be gathered in the main square, and they will dress the colours of their "ceraioli": yellow for the Saint Ubaldo's candle, blue for Saint Giorgio's candle and black for Saint Antonio's candle. The streets of the city will be also full of flags and banners with the symbols of the saints. The view of the splendid main square of Gubbio, overcrowded by multi-coloured people, is awesome. >> Live the emotion of participate to the Festa dei Ceri, start now to organize your holiday! We suggest you the best hotels, b&b and farmhouses in Gubbio! The origin of the Feast of "Ceri"
The origins of this feast are rooted in the centuries and are subject of many historical researches. Some scholars trace it back to pagan ceremonies in honor of the goddess Ceres. Still others speculate on 1154, celebrations after the victory of Gubbio against 11 allied cities. The most likely hypothesis, and preferred by eugubini themselves, is due to the figure of Ubaldo Badassini, Bishop of Gubbio in the twelfth century, and today Patron Saint of the city, Saint Ubaldo. Beloved by the people, he died on 16th May 1160 and all citizens for the occasion made a pilgrimage with illuminated candles. Since that year, the procession "del transito" has been organized every year on the evening of the eve of his death, on 15th May, with the offering of votive candles from "Arts and Crafts" Guilds. As we read in Statum Eugubii of 1338, members of the guilds of the richest arts, Muratori (Bricklayers), Merciai (Milliner's shops), Vetturini (Drivers), "they went iubilantes et gaudentes with Three Cereos Magnos of wood, covered with wax". The Cereos Magnos of wood, i "Ceri", are part of the celebrations and they are indeed the real stars of the highlight of the festivities: the Race of "Ceri". This race between "ceraioli" is certainly one of craziest and exciting historic races of Italy. Small detail, to emphasize: the race is uphill! The candles are three tall heavy wooden artifacts, surmounted respectively by statues of Saint Ubaldo (protector of Bricklayers), Saint George (protector of Milliner's shops) and Saint Antonio Abate (protector of farmers and today also of students). 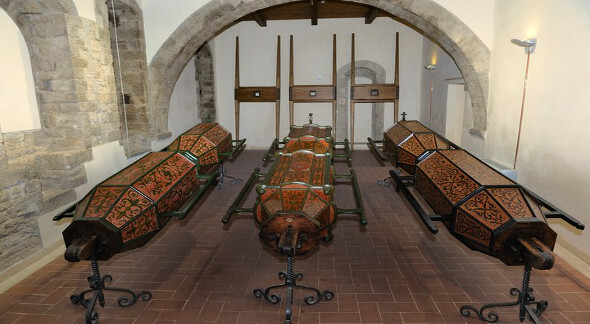 Decorated by many motifs, the candles are fixed on stretchers in the shape of "H" so that it can be moved vertically and transported by "ceraioli". 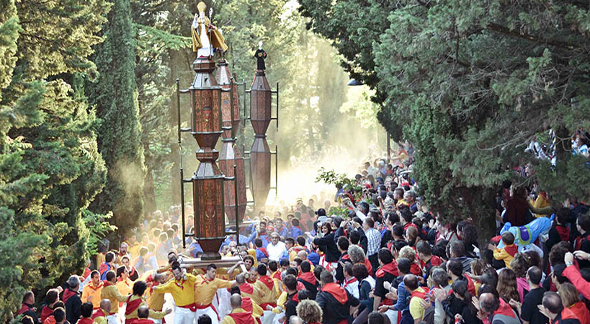 With a height of nearly 5 meters, the "Ceri" are impressive to look and they take approximately 10 men per "manicchia" or pole (4 for each candle) to be transported, with a weight that is between 300 and 400 kg. 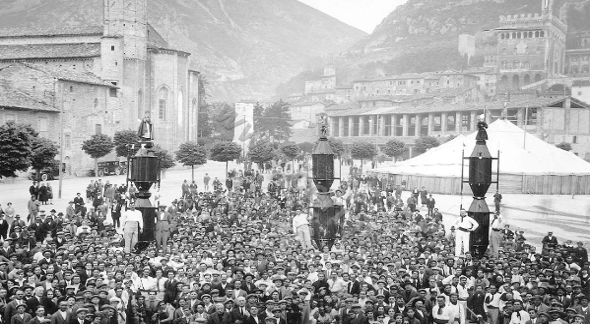 In addition to the parade through the streets of the city, during the competition the candles are carried on shoulders and the "ceraioli" go through Gubbio to reach the Basilica of St. Ubaldo, located on the top of Mount Igino that overlooks the city. The organizational part of the Race is entrusted to "Primo Capitano" (First Captain) and "Secondo Capitano" (Second Captain), elected by lot among members enrolled in University of Bricklayers with two years early. The election take place at 7:30 a.m. on 15th May at the Church of San Francesco della Pace (called "of Bricklayers"), among those whose families belong at the category with three generations at least and are now foremen. The captains elected choose three "Capodieci", one for each candle, and nine substitutes, committed to working together with them. "Capodieci" recruit "ceraioli", often among friends and relatives, bring their candle and "organize" it, coordinating "ceraioli" into teams and shifts. Every 70 meters (maximum distance traveled by a man, both for his physical safety than for the one of the candle), in fact, there is a "muta", a relay. "Capodieci" is also protagonist of the impressive opening cerimonial, starting at 11:45 a.m. at Piazza Grande: at the tolling of the bells of Palazzo dei Consoli, the "Alzata dei Ceri" ("Raising of Ceri") takes place, with Capodieci that jumps up on his own candle, fix it firmly to the stretcher to ensure stability, and crown it with the statue of the saint. Then, between candle and strecher, he spills the water with which was filled a beautiful ceramic jug, and then he throws it away with people who rush to seize the pieces, considered good luck charms. The three candles are then transported around the city. The real Race of "Ceri", 4 km between the slopes and narrow descents of Gubbio, takes place late in the afternoon, usually at 6:00 p.m.. The candles have to run at the maximum speed that is possible. It is a mad race, but not a real competition, because they must respect the starting order on arrival, with the Saint Ubaldo's candle ahead. The best "ceraioli" will be chosen directly by the whole inhabitants of Gubbio. >> Many hotels, farmhouses and b&b are waiting for you in the area of Gubbio during the Feast of "Ceri", organize your stay and don't miss this unique event! Some useful informations about the Feast of the "Ceri"
The Info Tourist Service IAT Gubbio has prepared a program for the day of 15th May, that can be viewed by clicking Programma della Festa dei Ceri (times may change in the various annual editions). Very interesting is also the map of Piantina del Percorso dei Ceri, useful to choose a location from which admire the race. For more informations about the Feast and the Race, we refer to the official website or to our page dedicated to the current edition 2018 "Ceri Festival"